Want a topside view of possible problems? NagVis is an easy tool for visualizing the status of your network. Nagios is a popular open source monitoring tool that helps you keep tabs on the status of hosts and services on your network. If all of your services are running fine, you are probably satisfied with the default display you are using now. However, if you have a large network, or if your network is prone to occasional, unexpected problems, you might be happier with a visual representation. A graphical rendering of your network offers a quick indication of where the problems in your network might be. In addition, managers often like pretty pictures and the convenience of a visual overview. NagVis  is a helpful Nagios add-on that lets you visualize the systems on your network. The idea is that you create your own background images (called maps) and then embed icons on the images representing hosts and services on your network. Each icon displays the current status of the host or service it represents. This simple yet flexible design lets you deploy NagVis in a number of useful ways. For example, you could create a geographical map of your server room and embed icons at the physical locations of the various servers. A map could also serve as a schematic view of a single-server computer with icons representing services running on the server. NagVis even supports sub-maps, allowing for a very flexible representation of large networks. For instance, one map can represent a building, and sub-maps within it can represent rooms within that building. A NagVis map is made up of a background image and a number of symbols representing services and hosts. In addition to the obvious benefits of seeing a map that represents the geography of the network, another useful way to implement NagVis maps is to create a diagram of your logical structure. For example, you could divide systems into groups on the basis of their functionality – such as, the front end, middleware, and databases. A Nagios service or host is represented by an icon, and the icon changes its appearance according to its status. If a service is in a critical state, you'll get a quick warning about the problem just by noticing a change in the icon. NagVis uses the Nagios user configuration file (/usr/local/nagios/etc/htpasswd.users) and thus the same access rules apply. However, you also have the option of specifying a different file with a different set of users – for example, ../share/nagvis/etc/.htaccess. In this way, it is possible to give specific users access to NagVis Maps without allowing them direct access to Nagios. NagVis is a PHP/AJAX application built on Nagios. In addition to Nagios itself, you'll need to make sure you have Nagios Data Out (NDO) and NDOutils installed on your system. (NagVis gets all of its status information from the NDO database.) For this article, I used Nagios version 3.0.6 and NDOutils 1.4b7. Also, I am assuming you have Nagios 3.x with NDO running and that you have a basic familiarity with both Nagios and NDO. NagVis is a web-based application, so you'll also need a web server and at least PHP 4.2 or higher, as well as a number of other packages. (See the box titled "Packages Required for NagVis.") Note that NagVis does not need to be running on the same machine as Nagios. 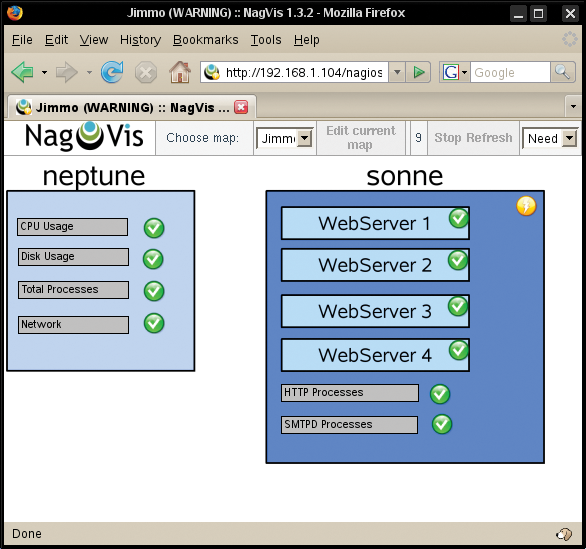 It would be possible, for example, to run a NagVis instance on an external web server and Nagios on an internal server. In one case, I even went so far as to provide NagVis access to customers without allowing access to the underlying Nagios instance. Throughout the configuration file, you will notice that most of the parameters are commented out by default. NagVis is self-documenting, and you are given default values for the various parameters. The parameters for the Nagios database are set in the block defining the so-called back end. A NagVis back end is simply a data source. The default back-end type, ndomy, which means Nagvis gets the data out of an NDO MySQL database, is the only option currently supported. Be sure to change the dbuser (user) and dbpass (password) parameters to the appropriate values. Although you can use the same user as Nagios, as long as the user can read the database, there is no problem creating a user specifically for NagVis. By default, you have just one back end, defined as [backend_ndomy_1]; however, you can define more. Therefore, it is possible to display information from multiple Nagios instances on different machines. All you need to do is set the necessary parameters in the definition of the back end. Note that you must include backend_ in your definition in order for NagVis to recognize it. If NagVis doesn't work at first and the on-screen error messages are not helpful, you will need to take a look in /var/log/messages. This file often provides additional information on the real cause of the problem. One of the most common problems is not being able to access the MySQL database, which is indicated by the error message "Could not open data sink!" Once you install Nagios, you might notice that several default services are configured for the localhost (i.e., the machine on which Nagios is running). These services are well known, so when you get NagVis running, it will automatically recognize these services and display them accordingly. At this point, you might be tempted to simply jump in and start configuring your map, but you are missing one key component: the background image. Start the configuration by pointing your browser to http://HOSTNAME/nagios/nagvis. This address brings you to the NagVis start page (Figure 1). If you click on one of the thumbnails, you arrive at the full-scale map (Figure 2). At any point, you can click Edit current map to get into edit mode. Then right-click the map to pop up a context menu. 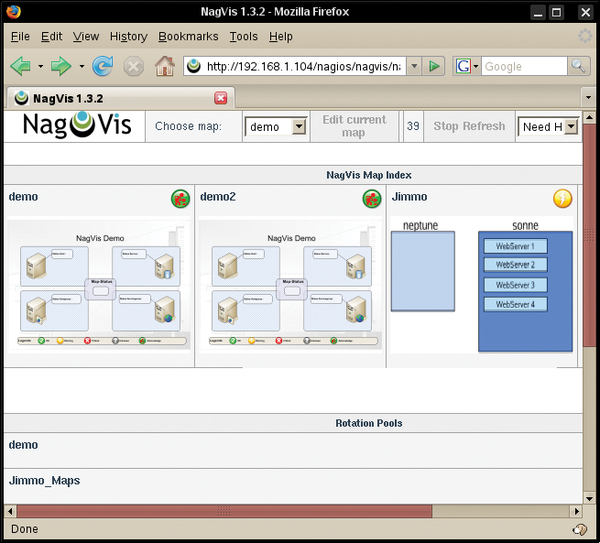 The first option, Open Map, opens the selected map in the NagVis editor. The option Open in NagVis opens the map in read-only mode. Options lets you configure the current map. Figure 1: The Nagios start page provides a first look at your systems. Figure 2: Even a simple NagVis map can be quite effective. The Nagvis Configuration option is used to configure NagVis itself. Unless you have made changes directly to the configuration file, you will see that all the fields are empty in the default configuration. One useful aspect of NagVis is that it only reacts to hard states. That is, if a service has a short hiccup and is momentarily unavailable, you usually won't see the map change. If you would prefer to learn about all status changes, change the only_hard_states parameter to no when you configure the host.